I fully understand that the 1969 motorcycle road film “Easy Rider” is considered a motion picture classic. I also understand that the movie introduced a new style of filmmaking that had a great impact on the industry. But while so many film critics and movie fans hold “Easy Rider” in high regard, I found it to be a flat, muddled, and occasionally annoying picture that hasn’t aged well at all. At the time of its release it was a relevent film examining such things as the hippie movement, the drug culture, and the late 60’s political environment. On the surface it may sound like an intelligent and thought-provoking experience. But it’s banal presentation, clunky storytelling, and overly cynical portrait of America did nothing to draw me in or keep my interest. “Easy Rider” is a buddy movie about two motorcycle riding potheads named Wyatt (Peter Fonda) and Billy (Dennis Hopper). It sounds like the ingredients for a stoner comedy but they are actually treated seriously. They’re free-spirited counterculturalists who are out to capture their idea of live-by-your-own-rules Americanism. After smuggling some cocaine across the border, the two sell it in Los Angeles for a large amount of money. They then use that money for a road trip across the southwest and eventually to Louisiana where they hope to make it in time for Mardi Gras. They travel from location to location with just their bikes, a gas tank full of hidden money, and apparently a bushel of marijuana. Just like any other road movie, “Easy Rider” is more about the journey than the destination. As they travel, Wyatt and Billy see some beautiful sites and encounter a wide assortment of people. They are helped by a rancher who is struggling to make ends meet. They pickup a hitchhiker (Luke Askew) who leads them to a hippie commune filled with people who resemble space aliens more than human beings. They befriend an alcoholic civil liberties lawyer named George played by Jack Nicholson. They are arrested by small town police officers and harassed by intolerant locals. Yet the one constant seems to be their love for pot. It seems like during every stop they take time for a smoke especially at night as they sit around their camp fire rambling while under the influence. The story ultimately becomes about Wyatt and Billy’s search for freedom, freedom that turns out to be much more elusive than they thought. “Easy Rider” is basically the hippie movement’s self-portrait and it looks at everything through their eyes. But it comes across as a sanctimonious and often times self-indulgent lecture that doesn’t have near the substance it wants to have. One prominent movie critic who is older than me praised the film saying “Seeing the movie years later is like opening a time capsule.” I guess I can see where the movie would have a stronger impact on you if you were a part of those years or if you’re sympathetic to the hippie culture. But as someone seeing it for the first time it feels incredibly dated and it definitely comes across as a drug-induced hallucination at times. It does dabble in a few interesting themes and the cinematography is impressive especially considering the tiny budget. But I never connected with “Easy Rider” or its characters. This is a movie that is considered by many to be great. In fact, it’s #84 on AFI’s Top 100 Movies of all time. I don’t see it. 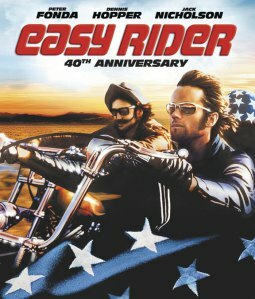 Maybe it’s the overwrought counterculture message or maybe it’s just my personal disconnect with this element of that time period (I was born is 1971), but “Easy Rider” became an uninteresting and sometimes tedious undertaking. There are several scenes including a terribly annoying drug high in a cemetery and numerous campfire ramblings that had me desperately wanting to hit the fast-forward button. What little screenplay there is does nothing to help the film and the final few scenes of the movie feel cheaply pasted together. We do get some pretty camera work and a breakout performance from Jack Nicholson. But that’s not enough make me want to watch “Easy Rider” again. No thanks, I’ll pass. This entry was posted in Classic Movie Spotlight, Movie Reviews - E and tagged dennis hopper, luke askew, movie review, peter fonda. Bookmark the permalink. Interesting review! Don’t totally agree but I can see why it might not be to everyone’s taste. I love the drug trip in the cemetery and wish more people could see this movie. It has become more than just a time capsule… it’s about the passing/death of a movement and is therefore a great tragedy… with a great star turn from Jack! Thanks for checking out my review and I really appreciate the comments. I know without a doubt that I’m in the minority with “Easy Rider” and I certainly see what you’re saying. I just couldn’t connect with it on any level (and I have a WIDE range of films that I love). But this is a movie loved by a lot of people – more people than those who dislike it. Maybe after some time I can give it another shot but I’m in no hurry. I see Easy Rider as a nostalgia piece and nothing more. It has a soft spot in my heart if for nothing else the soundtrack. It was the first movie with rock and pop music in the background and then on an LP soundtrack album. Steppenwolf’s Born to be Wild, among other rock classics, was featured in the movie. At the time of this movie it was an anthem for a generation, but now it is just a cliche. So it goes for Easy Rider the movie as a whole. I saw the movie the first time at the Fordyce Drive-In Theatre when I was 19 years old. It had many young men dreaming of hitting the open road on a motorcycle with no responsibility, or a care in the world. Myself, my dislike of cycles would forbid me from doing that. The counterculture was a new toy in 1969. There were other movies from the era too that glorified the hippies, etc. If you haven’t already you need to see Jack Nicholson’s Psych-Out or any of the Billy Jack movies. I do tend to see the original flower children as innocents who believed what they preached. Vietnam was dragging on and I think most everyone knew it was a hopeless cause. Also in 1969 were the Manson Family murders and the hippie movement lost it’s innocence. Whenever it is aired I try to watch Easy Rider. I don’t take it seriously and never thought it was high art. At times it breaks down as pure corniness, such as the layover at the commune. It was the breakthrough role for Jack, so that is something good to come from it. Also, did anyone realize that one of the prostitutes was Toni Basil who had a hit record in the 80s with Mickey? Peter Fonda’s character was usually referred to in the movie as Captain America. Not quite the straight laced superhero of the time. I was 19 when I saw Easy Rider the first time. It still has a soft spot in my heart from a purely nostalgic point of view. It featured rock classics such as Steppenwolf’s Born to be Wild which at the time was an anthem, but is now a cliche. Viewing it in the 21st century exposes some of the corniness, such as the layover at the commune. I’ve never thought of Easy Rider as high art and I’m surprised it made that best 100 list. Whenever it is aired I try to watch it just for the fun of remembering an era that is long gone. THAT’S RIGHT! That was Toni Basil! I saw the name and never made the connection. I also read where Wyatt and Billy were named after Wyatt Earp and Billy the Kid.